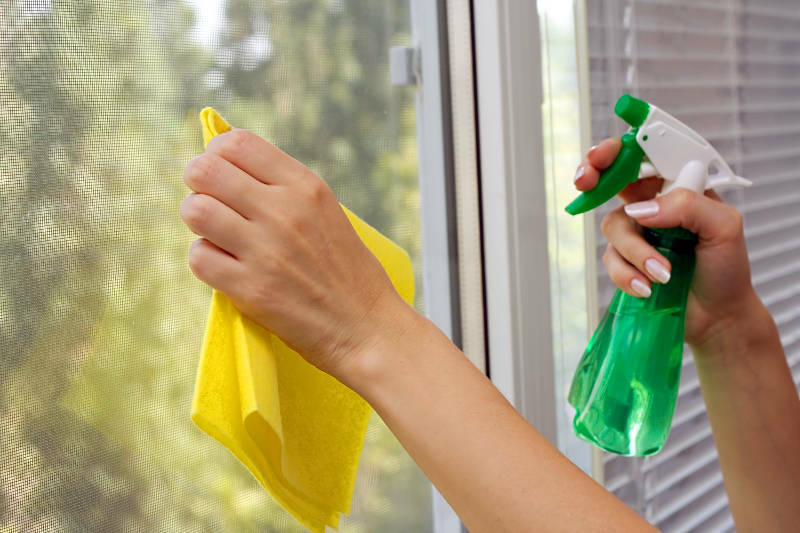 If you hate washing windows every spring, you’re probably used to standing out in front of your house for hours with a wad of paper towels and a bottle of Windex. What if washing your windows could be faster, easier and maybe even a little bit more enjoyable? We just may have some tips for you on how to do a more professional cleaning job on your windows this year. Keep reading to learn how to wash windows like the pros. What’s Wrong with Washing Windows My Way? What’s the big deal if I just squirt? Well, for one thing, that’s just not the most efficient way to clean a window. The dust and dirt won’t fully transfer over to the paper, so it’s just being moved around to different spots on the surface. This can also create static which attracts even more dust bunnies. Plus, you’re using a lot of elbow grease with this method and you’ll soon get too tired to complete all the windows. There are much better ways! To wash your windows like the pros, you need one very simple tool: a squeegee. That’s how they get that streak-free shine, and you can get one at any home and garden store. We recommend picking up a handful of 10 to 12 inch squeegees, since you’ll want to use a new one each time the “blade” becomes warped or nicked. Keep an eye on it as you work: if the edge of the blade starts to leave streaks or just isn’t performing as well, you can use the other side of it until it’s time to replace the whole thing. The rest of the items you’ll need include a five-gallon bucket of water (or other container wide enough for the squeegee to fit in), a squirt of dish soap, a sponge or scrubber and a microfiber towel. If you like gadgets, you may even be interested in trying a squeegee-scrubber combination tool which can be found at most home and garden stores. Just be sure to avoid anything harsh or abrasive, as they could scratch and damage the glass. To get started, fill your bucket with water and add a squirt of dish liquid. If the weather is warm, you can just use the cool water straight out of the garden hose. If the weather is cold, add in a little bit of windshield washer solution to prevent freezing. Dampen a rag and clean off the window frame, then you can begin on the glass. Dip the scrubber or sponge into the bucket and give it a squeeze to wring out some of the water. Then, use circular and side-to-side motions to scrub the glass, loosening all dirt and stuck-on grime. Once you’ve loosened and scrubbed away all the dirt, it’s time to clear off the suds and reveal the shiny clean surface of the glass. Hold the blade of the squeegee vertically in the top corner of the window, then firmly press as you make horizontal sweeps across the windows – each sweep slightly overlapping the last. After every sweep, use a dry rag to wipe off the blade. If this is tiring, you can also choose to sweep the squeegee down vertically. In this case, use a microfiber towel to dry a little edge at the top to start from. Either way, you’ll be working from the top down. Now that you have clean and streak-free window panes, it’s time to buff out any leftover water. Use a clean, dry, lint-free microfiber towel to wipe the surface of the glass all over, revealing beautiful clear windows. Just using the squeegee instead of paper towels will already produce a superior result than what you’re used to, but we’re going to go all the way here and pay attention to detail like the pros. When you’re ready to squeegee your sudsy windows, start off by making a clean strip. Starting in a top corner, use just the corner of the squeegee blade to make a narrow edge of clean glass all the way to the end. This will make it much simpler for you to make large sweeps without making any mess. After each sweep, be sure to wipe off the blade with a dry part of the towel so that the squeegee is always dry before each new pass. If your windows are divided into grids, the process is much the same. You’ll use the same equipment and continue to work from the top down. Depending on the size of the panes, you may need to find a smaller squeegee. In any case, you’ll wipe down the frame, scrub the glass, then squeegee it in firm sweeps – but this time, you’ll hold a clean rag under the blade to protect the grid from the runoff. You might be surprised to learn that the method for professionally cleaning the interior side of your windows is basically the same. You can even use the squeegee. The trick is to reduce the amount of water used, in order to avoid making a mess inside the house or damaging any wood. To get started, put a dropcloth down on the floor and gather all your supplies. Squeeze out your sponge or scrubber firmly to wring out the water, then scrub the glass. 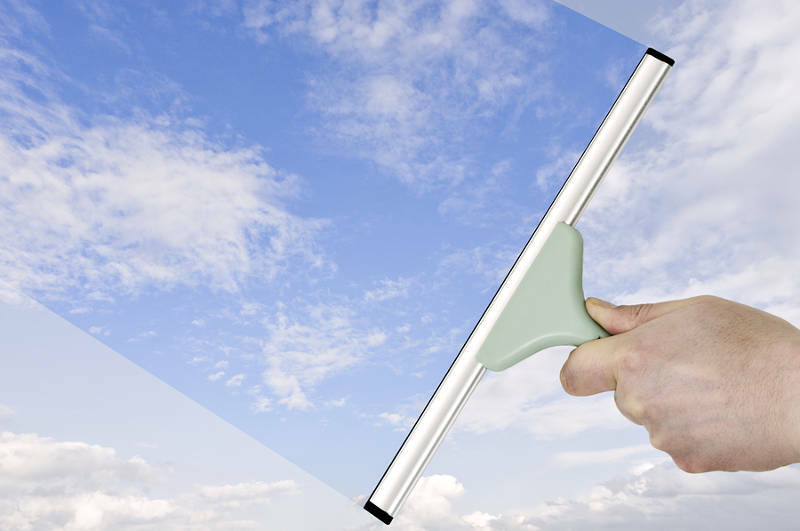 Use your squeegee as detailed above, but hold a rag underneath to catch any extra water. You should also avoid leaving the scrubber in the water when not in use, to reduce water runoff. If your windows are tall or on the second story, you probably won’t be able to reach them all by hand. A stepstool or ladder may be able to help. If you do get up on a ladder, consider using a ladder stabilizer or having a helper on hand. You can also purchase rods to mount the squeegee-scrubber on to extend your reach. In any case, never try to clean second story windows by leaning out them – you could easily fall out the window! What About Tough Dirt and Stains? What if your windows aren’t just dirty from normal weather and usage? Insect or bird droppings, grease, paint, label residue, lipstick and other hard-to-clean compounds may not rinse away so easily. For stuck-on compounds, try removing them with a damp, non-abrasive nylon scrubbing pad – testing it for scratching in a small area first. For greasy stains, you can rub on a degreasing dish liquid or even a spray solution such as Fantastik. Goo Gone is a great solution for removing that sticky residue from labels and stickers. You may have heard to use a razor blade to clean paint and similar compounds from windows, but be careful as this can damage the glass. If you have tempered glass or windows with special coatings you’ll want to avoid razor blades and try the other methods instead. After you have successfully removed the obstacle, you can continue cleaning the windows as outlined above. This professional method of washing windows is quick, easy and even rather fun once you get into a rhythm. Once you see the sparkling results and still have energy left over to work on other projects the rest of the day, you won’t be dreading window washing season again next year after all. Speaking of windows, Feldco offers high quality, vinyl windows to homeowners in the Quad Cities. Not only that, but they’re installed by factory trained and certified professionals. If you need new windows, get a free quote from Feldco now.